I hope your holiday was filled with friends, family, laughs and good food. My family is pretty large so the kids get an INSANE amount of gifts. The aftermath of Christmas is definitely the worst part...still trying to get organized! Two of my gifts? This neoprene like top from Asos and this vintage saddle bag. Wasn't in love with all my gifts (even the ones I picked out) but these are definite keepers. There is something about white that makes leopard really pop. It is definitely my favorite color to pair with white. My least favorite color to pair with leopard? PINK...yuck! I did some research on Pinterest to see if I could prove myself wrong, and I have to say, I did not. This entry was posted on Monday, December 30, 2013 and is filed under asos,Banana Republic,Leopard print,prints,saddle bag,vintage,white. You can follow any responses to this entry through the RSS 2.0. You can leave a response. They work together in perfect opposition. An oxymoron. Love this look! 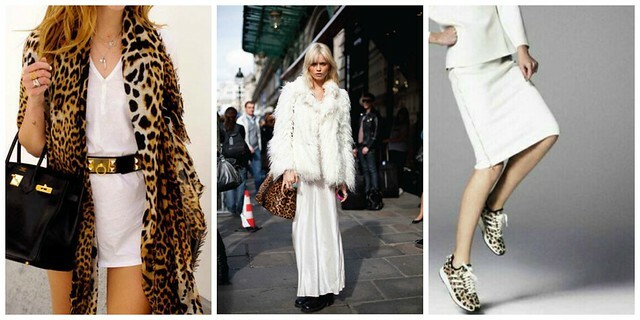 Yes, you're right...the leopard looks FAB with white!! Gonna have to try that particular combination myself; especially since white and leopard are both already resident in my wardrobe!! Precious pants, and beautiful look. You look gorgeous. Happy New Year, Sheree. Preach sister pink and leopard is just wayyyyy too much..... Love your new Christmas loot and of course now I want to try white and leopard!!!!!!! Hey lovely, glad to hear your Christmas went well :) Loving this new sweater of yours, the structure and cleanness of it is beautiful and I'm loving how you combined it with the leopard print trousers! I never really liked leopard print very much, but since I started reading your blog and seeing how well you wear it, I decided to go out and get some leopard leggings and I love them! I can't wait to wear them with white! And, I agree that the white and leo is perfect together! This outfit is perfection. So simple and chic, and the leopard is everything! Great look & happy New Year!